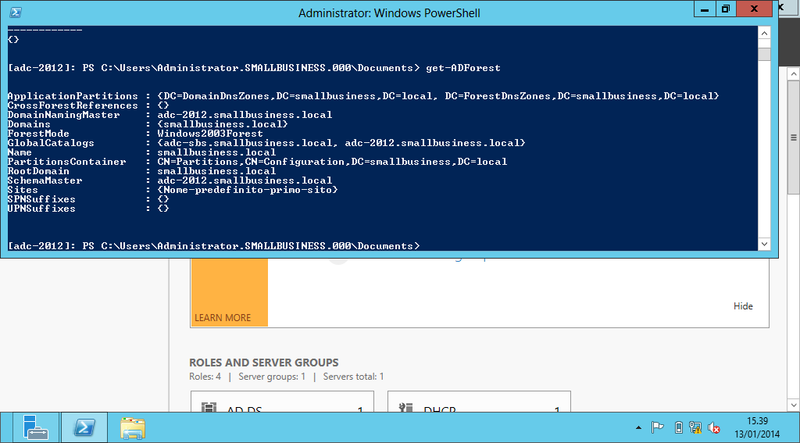 First of all, I’ve installed the Windows 2012 Server using a static IP address and set the preferred DNS server “pointing” to adc-sbs ip address. Next we have totally updated both Servers with all the latest Windows, and verified that the date/time is correct. First of all: backup ! We always need to ensure that we take a complete backup along with System State Backup of the SBS Server if something goes wrong. To ensure a seamless transition we need to perform an health check of AD in Windows SBS 2003 using tools like dcdiag.exe (contained in Windows 2003 Support Tools) and Microsoft Windows Small Business Server 2003 Best Practices Analyzer (see linkografia). In the new Windows 2012 environment I won’t use Exchange, WSUS and other stuff: for this reason, and also to avoid problems, my advice is to uninstall any software or service that is not useful in the Windows 2003 SBS. The procedure I usually follow in such cases is to make to make a list of software to uninstall: after that I uninstall of the first one, wait a few days to see that there are no problems between the users and other installed services, and then uninstall the later program in the list. Exchange is often very difficult to remove, but we have to uninstall fully, to make sure AD is cleaned up during the migration process. To simplify the transition to the new server, we need to minimize the number of GPOs involved. Also the Group Policy objects are updated a lot for Windows 2012: these are not simply a superset of the Windows SBS 2003 GPOs, but some of then can be incompatible. For this reason it is best to just leave the “main” GPOs, deleting all the others: at the end of the migration process we can recreate in the new environment the GPOs taking advantage of the new capabilities. Open Server Management: in the navigation pane, click Advanced Management, click Group Policy Management, and then click Forest: <Your Domain Name>. 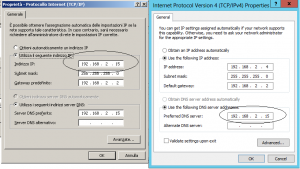 Repeat the step to delete all of the others GPOs: recommend leaving only Default Domain Controllers Policy and Default Domain Policy. Always to simplify the transition to the new server, and to avoid any issue in this process, we will remove any legacy an unused log script. Att. 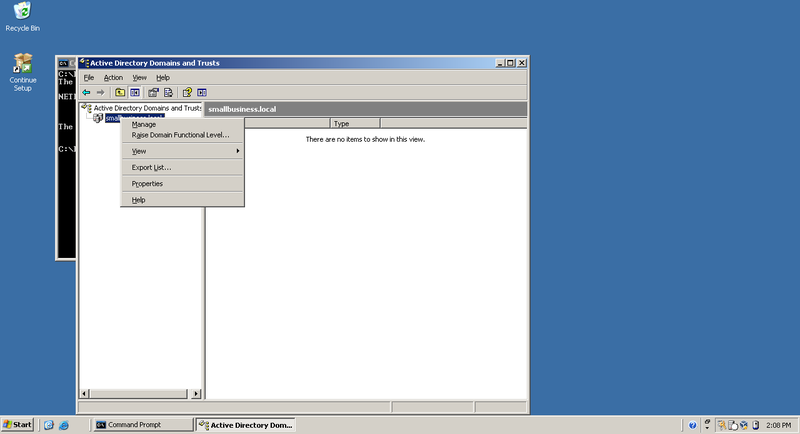 : Windows SBS 2003 uses logon scripts to install software and for other tasks. In Windows 2012 these task can be replaced with a combination of GPOs and logon scripts, that work more efficiently. Click Start, and then click Run: type \\localhost\sysvol\<DomainName>.local\scripts, and then press ENTER. Delete or rename SBS_LOGIN_SCRIPT.bat and check the other cmd or bat files. After that verify that all users’ profiles are updated to not use a logon script: to verify user profiles follow the next. 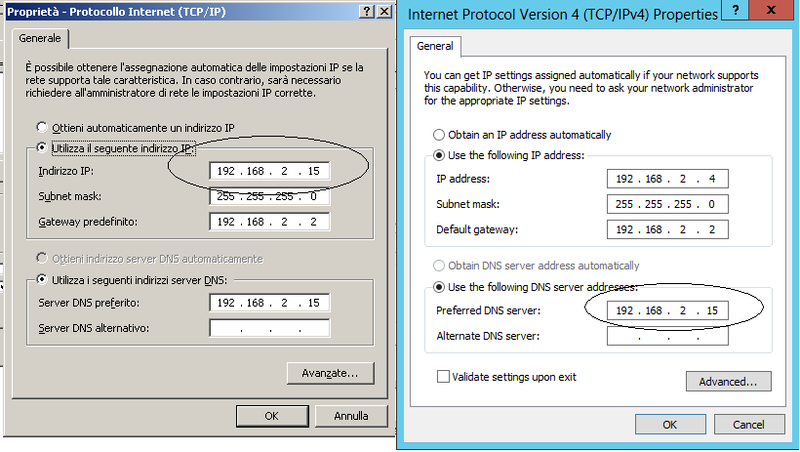 The minimum functional level must be at least Windows Server 2003: please control that the Domain functional level is set to Windows Server 2003, in AD Users and Computers right click the “Domain Name”. Also control that the Forest functional level is set to Windows Server 2003, in AD Domains and Trusts right click “Active Directory Domains and Trusts”. 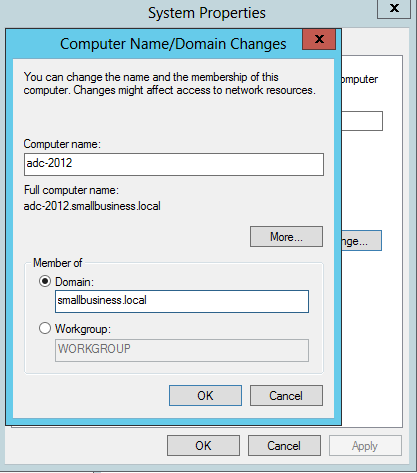 To join a domain, just click the current domain or workgroup name in Server Manager and . A reboot will be required. 2) Choose adc-2012 and click Next. 4) Leave selected Group policy management and then Click Next and then choose “Restart the destination automatically if required” and press Install . 1) After installing the Active Directory Domain Services feature on your server, it is possible promote it to be a domain controller. 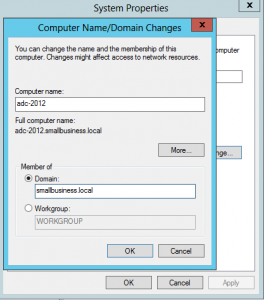 If you have just finished the feature installation, the AD DS Configuration Wizard begins automatically: however, if the feature installation has already been closed, you can start the Active Directory Domain Services Configuration Window by clicking the Tasks icon along the top of Server Manager and click “Promote this server to a domain controller”. 2) Supply the credentials for the operation: an administrative user in the domain. 4) Choose Domain Name System (DNS) server and Global Catalog (GC) and type the Directory Services Restore Mode password and then click Next. 5) Now you will be prompted with the warning in the next. 6) Choose Next and either use the default. Leave IFM (Install from media) Unchecked and click Next. 7) Location of the AD DS database, Log Files and Sysvol: here you can leave the default and click Next. 8) Click Next and then Next: here information about forest, schema and domain update is shown. Click Next and a prerequisite checks will be done. 9) Review the Check (usually all the warning can be ignored) and click Install. Att. : After you move the FSMO roles away from Windows 2003 SBS you have 21 days grace period to keep the server box running. After the completion of 21st day, the server simply will stop to work: so it’s recommended to perform these final steps before this period end. Once you transfer the FSMO roles to the new DC, adc-sbs will start to complain and shutdown itself down on regular intervals “by design” (pls see in linkografia Extend 21 day limit). 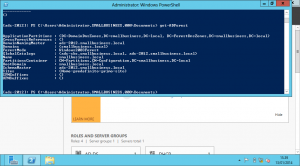 To check if adc-2012 hold all the AD roles use the next power shell commands. Att. : Do no select the flag “Delete the domain because this server is the last domain controller in the domain” otherwise all will be deleted ! The following command will force the time service in the new Windows 2012 server to do a syncronization, which will be reported in the System Event Log (pls check if all works fine) and set itself like a reliable time source in the AD smallbusiness.local. In the command line in the windows 2012 server the the following. 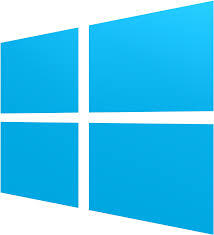 This entry was posted in Windows and tagged Active Directory, Windows, Windows 2012 by Giampaolo Tucci. Bookmark the permalink.